Being a garlic lover, I was intrigued to find Garlic, an Edible Biography: The History, Politics, and Mythology behind the World's Most Pungent Food--with over 100 Recipes by Robin Cherry (Roost Books, 2014). Ms. Cherry's book could be subtitled "Everything You Wanted to Know About Garlic, but Were Afraid to Ask," as it is replete with interesting facts (and rumors) about history, mythology (think vampires), agriculture, medicine, and culture. "In a 2000 study titled "Effects of Garlic Bread on Family Interactions, Dr. Alan Hirsch, neurological director of The Smell & Taste Treatment and Research Foundation, reported that the smell of garlic bread enhanced positive family interaction by 68.4%, while the taste of it increased pleasant communication by a staggering 99.4%." I know one family that wouldn't mind eating garlic bread every night, and this may explain the popularity of Olive Garden Restaurants. What was even more interesting was the connection between Jews and garlic. One of the first is when the Israelites were wandering in the desert and complained to Moses: "We remember the fish that we ate in Egypt free of charge; the cucumbers, melons, leeks, onions, and garlic. (Numbers 11:5). In fact, legend has it that garlic boost stamina, so "the Israelite slaves were fed garlic to keep up their strength as they built the fortified cities of Pithom and Raamses for the pharaohs. When the Jews returned to Israel after the Babylonian exile, Ezra, their leader, decreed several ordinances to perpetuate Judaism: the reading of the Torah on Monday and Thursday (as well as the Sabbath) and, among others, the requirement to eat garlic on Friday nights "because garlic served as an aid to passion and fertility and so would enhance the marital relations that couples were encouraged to enjoy as part of Jewish Sabbath observance." The Talmud (Shabbat 118a-b) suggests a dish of cooked beets, large fish and cloves of garlic to enhance Oneg Shabbat (the enjoyment of the Sabbath). The Talmud (Bava Kama, 82a) mentions five qualities of garlic: it satisfies hunger, it warms the body, it illuminates one's face, it increases seed, and it kills parasites in the intestines. Rabbi Levi Cooper ("World of the Sages -- Garlic Breath," The Jerusalem Post, June 12, 2008) noted that "Eating garlic was so part of Jewish identity that the Mishna rules that if someone pronounces a vow prohibiting benefit "from those who eat garlic," the one who pronounced the vow may not derive benefit from a Jew (M. Nedarim 3:10). This vow is recorded in the Mishna together with two other vows: If someone vowed not to benefit "from those who rest on Shabbat" or "from those who ascend to Jerusalem" - the vow prohibits benefit from any fellow Jew. Thus, just as our people were known to ascend to Jerusalem, and just as our people were known for refraining from work and resting on the seventh day, so too we were known as garlic munchers!" Jews called themselves garlic eaters (as a compliment), but it was also used as an anti-Semitic slur by Romans, "where the Latin expression 'allium olere' (stinking of garlic) was used to refer to people belonging to a low social class." The medieval concept of the foetor Judaicus (Jewish stink) linked "the sulfurous devil to the base, garlic-smelling Jews and differentiated them from the pure, sweet-smelling (and baptized) Christians. During this period, the German cities of Speyer, Worms, and Mainz were the most important communities of Jewish education in the Holy Roman Empire. The three cities were known collectively as 'shum' (Hebrew for garlic)." Maimonides wrote a letter to his son in which he warned: "Guard your soul by not looking into books composed by Ashkenazi rabbis, who believe in God only when they eat beef seasoned with vinegar and garlic. They believe that the vapors of vinegar and garlic will ascend their nostrils and thus make them understand that God is near them...You, my son, should stay only in the pleasant company of our Sephardi brothers...because only they have brains and are clever." I found this interesting because present-day Sephardim use a lot of garlic in their cooking. Garlic has been referred to as "Russian penicillin, Bronx vanilla, and Italian perfume." Many cultures have a long association with garlic. Besides the culinary delights, it is also touted with medicinal qualities and it is used in Indian Ayurveda, traditional Chinese medicine, and traditional European medicine. While I was intrigued by how many varieties of garlic there are, I was hoping for more Jewish cooking in the recipe section. Cherry credits Lebanon (not Israel) for hummus, and many of the Middle Eastern dishes that Jews eat have been adopted when living in countries like Morocco, Yemen and Tunisia. She includes "Carciofi alla Giudia" (Artichokes Jewish Style), which is a classic of Roman Jewish Cuisine. Although considered a trendy, ethnic dish now, Jews ate artichokes because they were inexpensive and one of the few foods available in the Jewish ghetto. The "Braised Brisket with 36 Cloves of Garlic," though not particularly Jewish, would make a lovely addition to a holiday meal, and the "Bukharian Fried Fish with Cilantro-Garlic Sauce" is touted as "a traditional Jewish Sabbath dinner in Uzbekistan." If this is so, let's hope they're not using catfish, which is not kosher. One day when I am feeling adventurous, I will attempt the "Roasted Garlic Crème brûlée." As the Yiddish proverb goes, "A nickel (now $2.50!) will get you on the subway, but garlic will get you a seat." 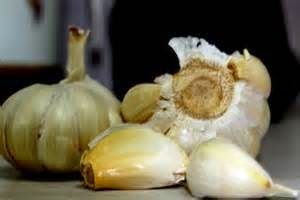 Lovely post and just the info I was looking for to accompany a series of garlic recipes I'm writing! Thx.